MIKHAIL GLINKA (1804-1857): Complete Piano Works, Vol. 1 - Variations on an Original Theme in F, on a Theme from the Opera Faniska by Cherubini, on 2 Themes from the Ballet Chao-Kang, on a Theme from Die Zauberflöte (second version), on the Romance Benedetta sia la madre, on the Russian Folksong In the Shallow Valley, on the Song The Nightingale, on a Theme from the Opera I Capuleti e i Montecchi, Varianti Brillanti on a Theme from the Opera Anna Bolena. 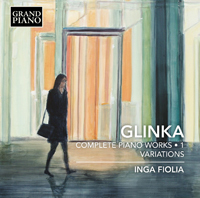 Description: A new series begins for Glinka completists. Inga Fiolia (piano).